That $25,000 annual salary works out to $12.02 an hour for someone working full-time for one year (2,080 hours paid, either for work hours or paid leave). That’s pretty low; about $1 above the “poverty-level wage” (the poverty line for a family of four in 2011 was about $23,000, equivalent to an hourly wage of $11.07). Segal’s article starts off talking about a former Apple employee, Jordan Golson, who earned just $11.25 an hour. Many of these Apple store workers are young, so one wonders how Apple wages compare with those of other young college graduates. The short answer is “not so good,” or even “terrible.” The hourly wages of young college graduates (those ages 23-29) in 2011 was $21.68 for men and $18.80 for women. To be fair, Segal notes that, “The company also offers very good benefits for a retailer, including health care, 401(k) contributions and the chance to buy company stock, as well as Apple products, at a discount,” so including benefits may offset some of the discrepancy between pay by Apple and pay by other companies. The information necessary to calculate this offset is unavailable, but it is not believable that these benefits fully or even significantly make up such a large shortfall in wages. How do Apple store wages compare to those of all college graduates? As the table below shows, $12.02 is far below the 20th percentile wage of college graduates, the wage that 80 percent of college graduates earn more than and 20 percent make less than. That’s right, Apple’s store employees’ wages are in the bottom 20 percent of all college graduates. In fact, $12.02 is $2.24, or 16 percent, less than the 20th percentile college wage in 2011. 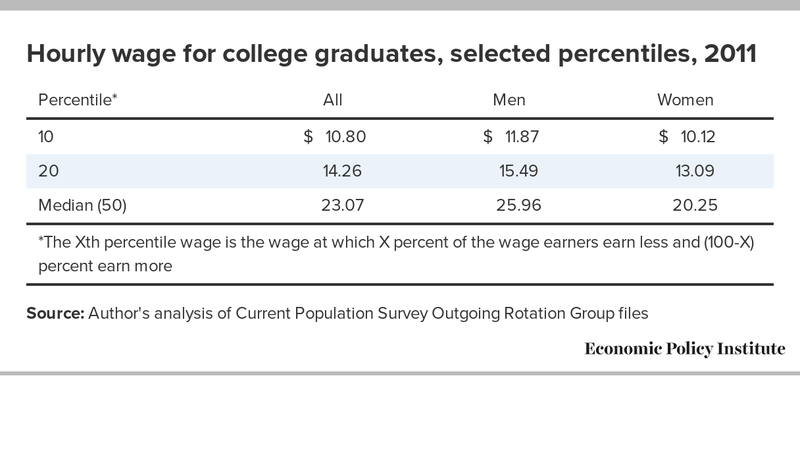 For college-educated men, $12.02 hourly is on par with the wage earned at the 10th decile, $11.87, meaning 90 percent of college graduates earned more than that in 2011. It is already well-known that Apple benefits from the extremely low wages and harsh working conditions of the Chinese workers who manufacture its products. As EPI’s Ross Eisenbrey and Isaac Shapiro recently wrote, “Apple workers in China endure extraordinarily long hours (in violation of Chinese law and Apple’s code of conduct), meager pay, and coercive discipline.” Together with the mediocre pay for Apple employees, even compared with other retailers, it is clear that Apple’s success does not translate to high or rising living standards for the workers who one would hope would benefit from its success. Apple could readily afford to pay the Chinese Foxconn workers building iPhones because their costs are a miniscule part of the phone’s costs. Raising pay is not that heavy a lift for Apple: In 2011, Apple’s nine-person executive leadership team received total compensation of $441 million, equivalent to the estimated compensation of 95,000 Foxconn factory workers assembling Apple products. The discrepancy between Apple’s profits/executive pay and its compensation to its workers is a particularly glaring example of what is occurring in the wider economy. The gap between CEO compensation and that of a typical worker is now 231-to-one, where it used to be just 58.5-to-one in 1989. Corporate profits are now higher as a share of corporate-sector income than in any year since the early 1940s when we had a War Labor Board consciously suppressing wage growth. And, this all contributes to the phenomenon that productivity—the ability to produce more goods and service per hour—has been rising rapidly but the hourly compensation of both high school and college-educated workers is totally flat. It does not look like much will change soon unless there’s a broad change of thinking among policymakers and a mobilized workforce. After all, current outcomes have been dictated by persistent high unemployment, low and weakly enforced labor standards (witness the failure of Apple to abide by California’s wage and hours law mandate of two 10-minute breaks a day, reported in the Times story), the inability of unions to set high labor standards, and the dominant political/policy influence of the wealthy and the business community. Apple’s labor practices and the overall failings of the economy have not been dictated by any economic laws. Rather, they are the result of eminently changeable public-sector policies and private-sector practices.